Matt Farnham previews Hibs’ Easter Road clash with Rangers on Sunday. Hibs face Rangers at Easter Road knowing that only a six-goal victory will ensure European football next season. Wednesday night’s disappointing 2-1 defeat to Hearts left the team with a mountain to climb to secure a top three place. It will require one of the all-time great performances. 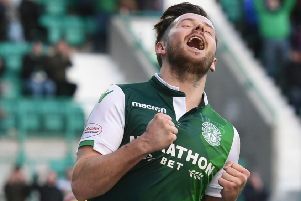 Anything other than a win by a six goal margin would see Hibs relying on Celtic winning the Scottish Cup final against Motherwell to bring Europa League qualification. However, the task has been overshadowed by Hibs boss Neil Lennon’s comments in the aftermath of the loss to Hearts and his no-show at Friday’s press conference. The absence, which left reporters and photographers waiting 90 minutes, was explained as Lennon suffering from the flu. Assistant manager Gary Parker, who carried out the media duties, insisted that Lennon’s scathing midweek comments were “just Neil” and that his outburst was a reaction to a pre-season goal of finishing second not being achieved. Parker continued by assuring those present that Lennon will still be there next season. On the pitch, Hibs are without long-term absentee Ross Laidlaw and Martin Boyle, who exited the Edinburgh derby in the first-half through injury. Hibs will likely return to a back three after switching to a four-man defence against Hearts. Club captain David Gray could fill in for Boyle, which would be his first appearance since November, or Lennon may opt for the attacking talents of Brandon Barker. The club need goals so the midfield trio of John McGinn, Dylan McGeouch and Scott Allan will likely support Jamie Maclaren, who started on the bench on Wednesday, and Flo Kamberi. Rangers caretaker manager Jimmy Nicol believes that Sunday’s match is an opportunity for some players to “buck up their ideas” before the imminent arrival of new manager Steven Gerrard. It will be the club’s third game under Nicol and he could lead Rangers to second. A draw at Easter Road coupled with Aberdeen losing to Celtic in Glasgow’s East End would see the Ibrox club achieve just that. If Aberdeen draw Rangers would require three points. Nicol will be without five key players with Alfredo Morales and Ross McCorie suspended, while Graham Dorrans, Wes Foderingham and Declan John are all out injured. Morelos’ suspension will mean that ex-Hibs star Jason Cummings will lead the attack, supported by Jamie Murphy and Josh Windass, with Daniel Candeias providing ammunition from the right-wing. If previous encounters are to go by it will be an exciting 90 minutes at Easter Road. Last five meetings: Rangers 1-2 Hibs, Hibs 1-2 Rangers, Rangers 2-3 Hibs, Rangers 2-3 Hibs, Hibs 3-2 Rangers. Hibs likely team (3-5-2): Marciano; Ambrose, McGregor, Hanlon; Gray, McGeouch, Mcginn, Stevenson; Allan; Kamberi, Maclaren. Rangers likely team(4-2-3-1): Alnwick; Tavernier, Bates, Martin, Halliday; Holt, Goss; Candeias, Windass, Murphy; Cummings.